Our new deepwater construction vessel (DCV) Aegir was christened during a festive ceremony in September 2013. This latest addition to our fleet is capable of executing complex infrastructure and pipeline projects in ultra-deep water and has sufficient lifting capacity to install fixed platforms in relatively shallow water. The design is a customized Ulstein Sea of Solutions SOC 5000. The living quarters are equipped to accommodate 289 persons in single and double cabins, with a maximum of 305 persons. Aegir has life-saving equipment on board for 399 people. 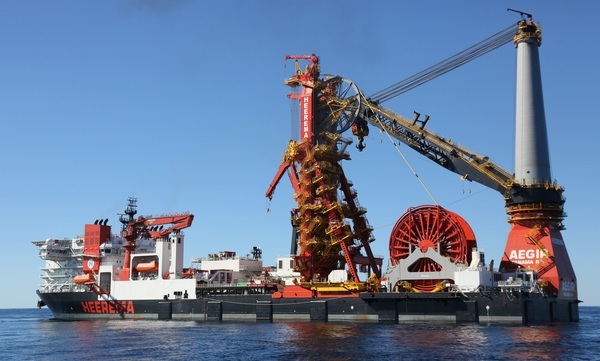 Type: Pipelay tower for J-lay and Reeling. J-lay: Quad joints, 32” OD Top tension 2,000 mT. R-lay: 2 x 2,000 mT reels capacity, 16” OD, 800 mT top tension. A&R system: 2,000 mT capacity. 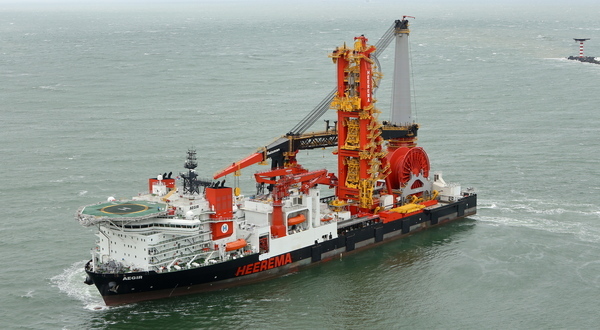 Deep water lowering: 3,500 m waterdepth, active and passive system heave compensation up to 750 mT. Type: Revolving mast type crane. Capacity revolving: 4,000 mT between 17 m and 40 m radius; 1,500 mT at 78 m radius. Lifting height: 96 m above main deck. Auxiliary Hoist: 750 mT at 23 - 92 m radius. Whip hoist: 110 t at 31 - 123 m radius. Two (2) knuckle boom cranes, each 40 mT SWL at 20 m radius and 5 mT at 40 m radius. Man riding certified. ROV: Two (2) ROV work class systems, launchable from ROV hangars at starboard and port side. LARS: Two (2) launch and recovery systems inside the ROV hangars suitable for 3500 m waterdepth. Main power: 48 MW total main power plant consisting of six diesel generators rated at 8 MW each. Emergency power: One emergency diesel generator set rated at 1731 kW. Two (2) 6.5 MW fixed pitch, variable speed, underwater de-mountable thrusters for main propulsion and DP. Four (4) 3.2 MW fixed pitch, variable speed, retractable thrusters for DP. One (1) 2.5 MW fixed pitch, variable speed tunnel thruster for DP and maneuvering.